I’ve never met a child who doesn’t like scissors; and as we creep closer to the new school year, it’s an important skill for preschoolers to have. 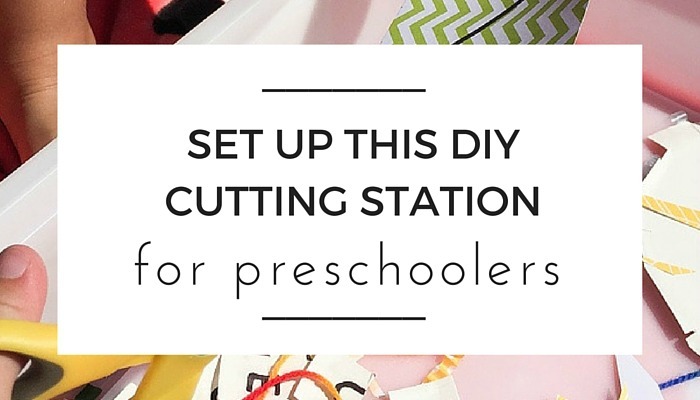 So we set about making this Preschooler DIY Cutting Station tutorial to share with you today. 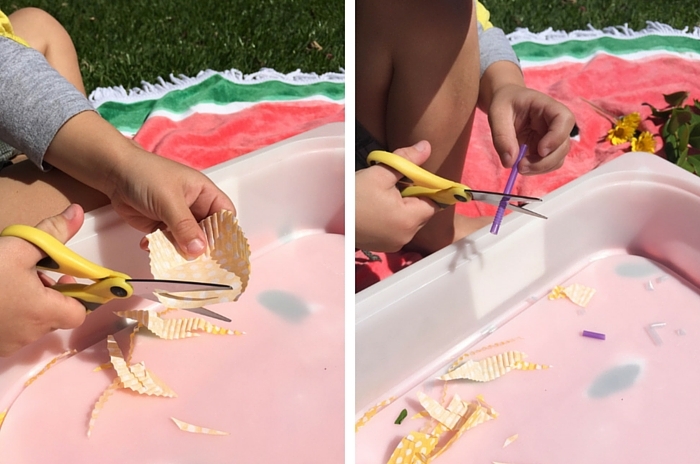 Scissor skills learned with activities like the preschooler cutting station builds hand muscles and develops hand-eye coordination, which in time will be the key to manipulating objects such as pencils & crayons. 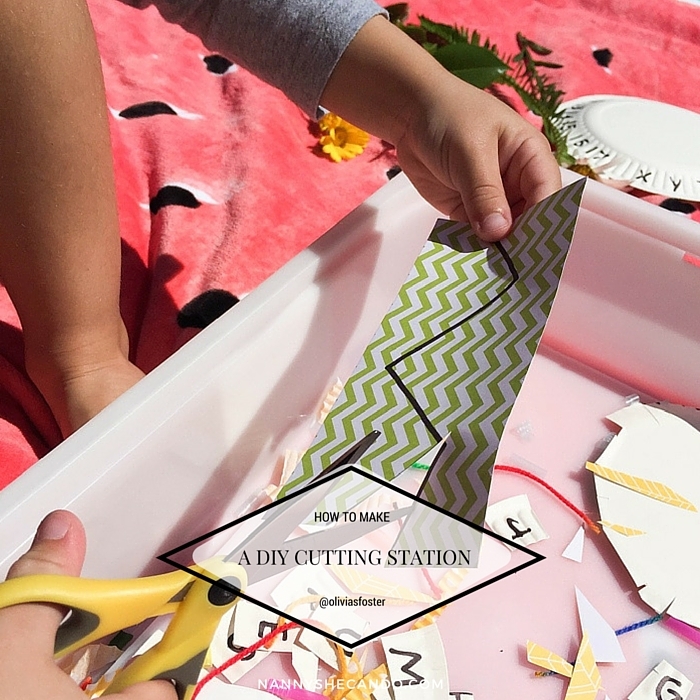 Cutting stations are so easy to put together! And boy, was it a hit! Mr4 spent 45 minutes snipping his way through paper, yarn, flowers and more. Straws – Straws in your cutting station are a MUST! This was the favourite, so much so we had to go grab another handful! They’re bound to bring squeals & fits of giggles as the straws pop & go flying in all directions. If you’re able to find all the bits of straw that have now been flung around the house, collect them & use them as beads for a simple threading activity! 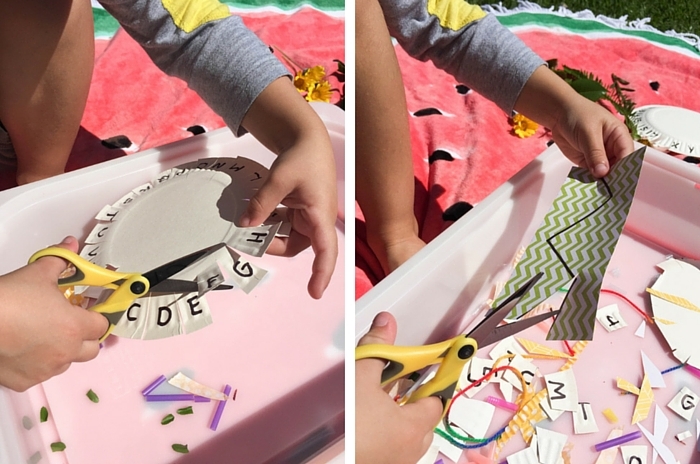 Paper Plate – Write letters or numbers along the outside of the plate, then cut between each letter and snip the tabs off! Do you think you would make a good hairdresser? 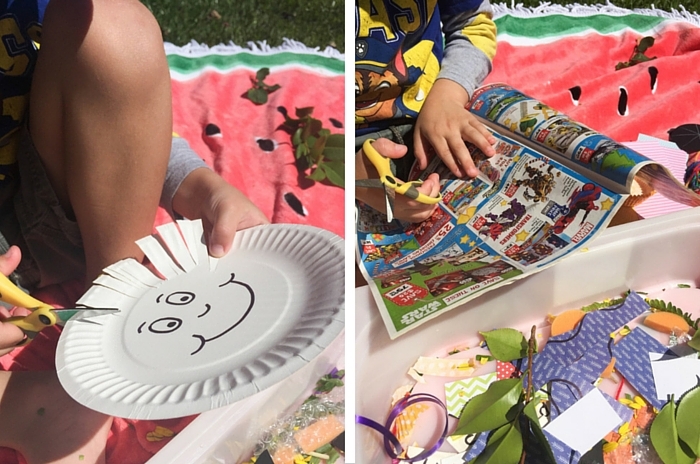 Draw a face in the middle of a paper plate and get styling! All our faces however, ended up with no hair, due to extreme cutting! Yarn & Curling Ribbon – These are both great for a cutting station as they’re easy to hold & snip! Mr4 held the yarn up in the air and snipped it into a million tiny pieces from the bottom, up! Flowers & Leaves – Explore the insides of flowers & leaves by using your scissors as a dissecting tool! This is a wonderful activity in it self. Add a magnifying glass & some tweezers to a tray of nature clippings & you’re ready to dissect! For the added bit of drama, include a pair of science-goggles or glasses. Paper – Take a few long strips of paper and draw a series of lines (straight, curved, zigzag etc) & shapes to cut along. Long, narrow strips of paper are also perfect for snipping into lots of tiny pieces! Props if you have a paper shredder! Magazines & Junk Mail – Being so close to Christmas, your cutting station could be as simple as cutting things out of magazines/junk mail and pasting onto a wish list for Santa! Of course before cutting, we had to have a quick browse through the brochure and decide what we’re wishing for! For more from @oliviasfoster, you can find this Spring Garden Paper Seed Shredder Tutorial, and a DIY Rainbow Sandpaper Scratch Paper. As always, supervision is required when children are using scissors. Make sure your child is using scissors appropriate to their age and remember to talk about how to safely hold, use and carry scissors. Cut in a direction away from your body and always be seated whilst cutting! Overall, I dub this 45 minute long activity a SUCCESS! // Does this sound like something your child would be keen on? Give it a go & let us know how it goes! Tag me, @oliviasfoster &/or #craftyliving & #nannyshecando in your posts!